Rolled roofing installation is the cheapest and easiest solution that you can imagine. It's good for particular situations, and don't work everywhere. Unfortunately, many residential and commercial property owners don't take this feature into account and use the material for their roofs just because it's cheap and easier to set up. It's practically the same with asphalt shingles but has long and thinner stripes. It's the same material that should be installed likewise. Roll roofing materials have several available types. Some are based in felt that is soaked with bitumen, others have a so-called mineral surface. The felt-based types are used as a kind of bottom layer while the mineral-surface types are used as an independent solution. Make the measurement of the roof and multiply the area by the price of 1 sq. meter of rolled roofing. Add the cost of contractor service to the cost of the material. NOTE: Don't forget to specify whether the old roof membrane removal is required when you talk to contractors. To save your precious time, Royal Roofing we offer FREE estimate service which will not oblige you to hire us. It's a good solution for flat roofs that have a slight incline or sloped ones with low slopes. The materials are set up onto buildings that don't need to be extra pretty. Asphalt rolled roofing installation is a usual choice for commercial and industrial buildings, garages, workshops, etc. Although after viewing several youtube videos it may seem that roll roof installation is a simple process, we wouldn't recommend untrained people to handle it on their own. Better call us at Royal Roofing Inc. and our professionals who know well how to install rolled roofing will do everything efficiently and carefully. Like other roofing material, roll one has both its advantages and drawbacks that you should remember before making your final choice and preparing the money for ordering and installation. It's cheap. These materials are even cheaper than asphalt shingles. It works on flat roofs. It's sometimes the only option that can work on flat roofs. It's installed quickly. Unlike shingles, tiles of any type that are installed one by one, unlike even metal sheets that need fastening one after the other, the roll roofing materials can be set up in several of hours if your roof is not big. It's easy to transport. Shingles, especially concrete ones, are heavy and fragile. Metal sheets, especially tin or copper, can be damaged during transportation. Roll roofing weighs less, it's tightly rolled and sealed. Replacement difficulties. These materials are like one long shingle and in case it's damaged, it's necessary to replace a big piece. While normal shingles overlap each other, having free edges, and it allows them to be more flexible. Besides that, it's easy to replace a shingle without replacing a row of shingles of the entire roof. It's less durable. Specialists claim that such roofs can last for 5-8 years. While composite shingles can last for about 20 years. Less property price. In case your building has roll roofing and you want to sell it, don't think such roof covering adds value to the property. Roll roofs are, at the same time, a popular choice that can be utterly correct if it's recommended and installed by professionals. 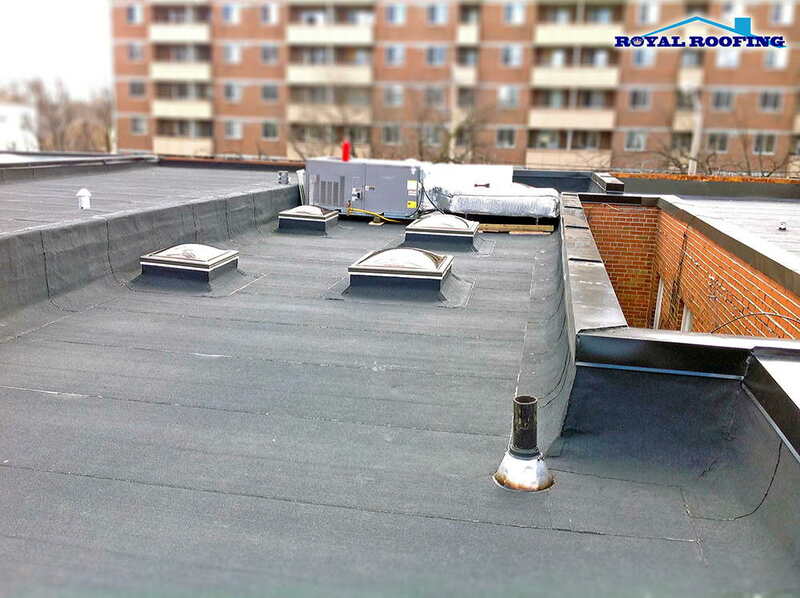 If you want to have a roll roof that will serve you longer, turn to us at Royal Roofing Inc.
Generally, roll roofing consists of layering the strips of composition roofing sheets in an overlapping pattern. Composition roofing is manufactured in rolls (hence the name of the roofing system), which can be made of various materials including asphalt, granulated roll roofing, asphalt saturated organic felt (which is available in both; standard and specialized options), re-enforced fiber-glass, SBS modified, and many more. In order to enhance the durability of the roofing material, a number of components are often mixed to create a single roll of roofing, resulting in increased flexibility, tear and slip resistance, water absorption, adhesion and thermal stability. The most commonly used material in roll roofing is asphalt, which is most suitable for steep roofing systems, however can also be used for flat roofs. On the other hand, fiberglass roll roofing is most appropriate for roofs with a low slope, and modified bitumen can be applied to all types of roofs. The commonly used term for saturated felt roofing is Roll Roofing. Smooth Surfaced Roll Roofing. “Coated felt” is another name for this type of roll roofing, which in itself is smooth surfaced roofing roll, covered with mica or ground talc after application. The primary use of this is as flashings, to protect the intersecting or protruding roof areas, as well as the roof’s valleys and eaves. Saturated Felt. This is an asphalt-infused felt that is based on organic materials, which serve the role of underlayment between the roofing material and the deck of the roof. Another name for this is asphalt roofing, for which felt can be produced at customizable levels of weight. Specialty-Eaves Flashings. This is a polymer-modified bituminous sheet material of a self-adhesive nature, which is designed for application along roof eaves, as well as other areas, requiring specialized flashing. The most common regions for the use of this material are those where water backups and ice dams tend to occur. Mineral-Surfaced Roll Roofing. The most common use for this type of roll roofing is as a primary roof surfacing and is used mainly on secondary-use smaller buildings such as barns, supply buildings, garden sheds, etc. Granulated minerals are embedded into the top surface of this material. During the installation of roll roofing, sheets of material must be applied to clean and dry plywood, and should run parallel to the eaves. Following the installation, roofing cement should be applied to seal all selvage end laps and laps. This type of roofing is appropriate for all roofs with slopes of at least 1 in 12. Two possible ways for installing roll roofing are the hot and the cold asphalt methods. The hot asphalt method is much more dated and conventional, making the cold asphalt method the one that is most preferred and popular. This method consists of smoothing spreadable adhesive onto of the roof and installing roll roofing overtop. However any simple adhesive can be used in the installation of roll roofing, or even nails can be utilized instead. A major precondition for the installation of any roll on roofing is a roof surface that is totally dry and clean.